As Zimbabwean Cricket falters, “son of the soil” pushes England Cricket to greater heights. 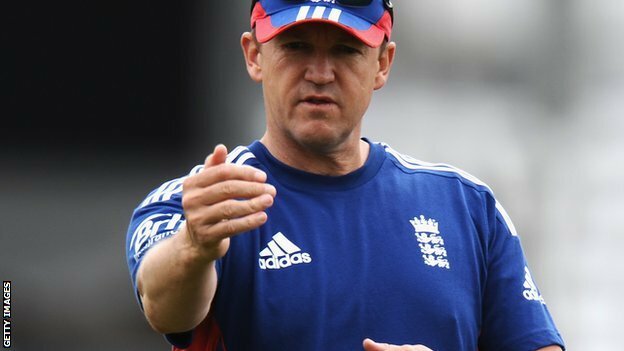 Former England coach Andy Flower has been appointed as technical director of elite coaching by the England and Wales Cricket Board. The 45-year-old stood down as England’s team director in January after the 5-0 whitewash by Australia. The ECB said Flower’s new role involves working with the “next generation of England players and coaches”. “I see this as a great opportunity for me as I start a new phase of my career,” said Zimbabwean Flower. ECB managing director Paul Downton said he was “delighted” to have retained Flower’s “experience and quality”. Flower, who scored 4,794 runs in 63 Tests, was appointed England coach on an interim basis nearly five years ago before taking up the post permanently. During his tenure, he led England to three Ashes wins, the World Twenty20 in 2010 and to the top of the world Test rankings. However, following the 5-0 defeat by Australia last winter he decided to step down, saying he did not feel he was the right man to try to restore England’s fortunes. His new role will be based at the national cricket performance centre in Loughborough. “Not only will Andy work with both players and coaches but he will also look to enhance the relationship between the county coaches and the England set-up,” added Downton. “He will also work with Level 3 and 4 coaches in the ECB coaching structures. Flower said: “I am particularly excited about the chance to build and mould a leadership course which is not simply about captaincy but much more. Flower’s previous role as head coach is yet to be filled by the ECB. Posted on 3rd March 2014 by newsafrica. This entry was posted in Africa, Cricket, England, Human Rights Violations, President Mugabe, Sport, Zimbabwe and tagged Andy Flower, Ashes, Australia, England, England and Wales Cricket Board, European Central Bank, Flower, Paul Downton. Bookmark the permalink.